Petr Veliky, the most powerful ship in the Russian navy, recently crossed the Northern Sea Route for the first time. Although the event was virtually unnoticed amid the escalating military conflict in Syria, pundits believe its implications are also important for international security. The Petr Velikyheavy nuclear-powered missile cruiser recently crossed the Northern Sea Route for the first time in the history of the Russian navy. Although the event was virtually unnoticed amid the escalating military conflict in Syria, experts say its implications are as important for international security as a peaceful solution to the Middle East conflict would be. The unit of Northern Fleet warships led by the Petr Velikyheavy nuclear-powered missile cruiser followed a route through Kara Strait and Vilkitsky Strait into the Laptev Sea. There, the ships fired artillery and anti-aircraft weapons and then headed to Severomorsk—the main base of the Northern Fleet. Petr Veliky is the largest and most powerful ship in the Russian navy. It carries 24 Granit supersonic cruise missiles on board, as well as an arsenal of anti-aircraft missiles, artillery systems and weapons to fire on submarines and ships. Since it is nuclear-powered, it has virtually no restrictions on the length of its voyages. It is interesting to note that this is the first time that any military ship has reached these locations. The last time a large ship independently operated near these waters was in August 1942, when the German heavy cruiser Admiral Scheer sank the Soviet icebreaker Alexander Sibiryakovin an unequal battle. Since then, neither German nor Soviet sailors have penetrated any further into Arctic waters than Novaya Zemlya. According to navy Adm. Igor Kasatonov, former assistant commander, it was neither practical nor necessary to do so. "We protected our national interests in that region by means of scientific exploration missions, transporting civilian cargo, as well as developing a coastal navigation network. Now everything has changed, first of all, because the ice is melting across the Northern Sea Route in Russian territorial waters," said the admiral. A small Russian border ship with a displacement of just 1,000 tons left Murmansk on August 23, 2012, and arrived in Sakhalin on Sept. 20. It was the first to cross the Northern Sea Route alone and without icebreakers. The sailors later said that, during the entire crossing, they did not even see ice: It has almost disappeared from the Arctic. That means that navigation opportunities to the north of the continent have improved. For Russia, this has advantages as well as disadvantages. The good news is that the melting of Arctic ice off the Russian northern coast will allow for almost year-round navigation. The Northern Sea Route is the shortest route for transporting civilian goods from Europe to Asia and back. The world's largest deposits of nickel ores and oil and gas fields are located on Russia's northern coast, and in the seas off that coast are known deposits of hydrocarbons. The drawback is that, because the region was unreachable, neither the Soviet Union nor modern Russia secured the area with military forces. Moscow began to look into this issue literally just a few years ago. In 2007, under the leadership of Vice Speaker of the State Duma Artur Chilingarov, who was in charge of Arctic projects, the Arkitika-2007 expedition was launched. Its purpose was to prove that the underwater Lomonosov Ridge, which crosses the central part of the Arctic Ocean from the New Siberian Islands to Ellesmere Island in the Canadian Arctic Archipelago, is an extension of Russian territory. Evidence obtained during the expedition, including soil samplings from the ocean floor in the area, was presented to the international community to decide whether or not to increase the territorial waters of Russia. Although this issue is still not resolved, Moscow began to speed up the process of enhancing its military presence in the region. The general staff decided to create Arctic motorized infantry brigades; a unit of air defense forces and MiG-31 high-altitude interceptors were deployed to Novaya Zemlya archipelago. In addition, strategic bomber airbases in the Arctic region have been modernized. "The most remarkable thing about this is the fact that Moscow has been acting unilaterally," says Vadim Kozyulin, a professor of the Academy of Military Sciences. "The Northern Sea Route runs entirely within its current territorial waters. And the ice is melting near Russia's coast, which makes it impossible for other would-be contenders for a share of the Arctic shelf to actively operate in the region." However, it cannot be said that they have full control of the territory without the constant presence of naval ships. Kasatonov analyzes the route of the nuclear-powered cruiser from this point of view. According to him, the navy was conducting reconnaissance on the ground: This was the reason that almost the entire Northern Fleet command, as well as a delegation of senior officers from naval headquarters, were on board. 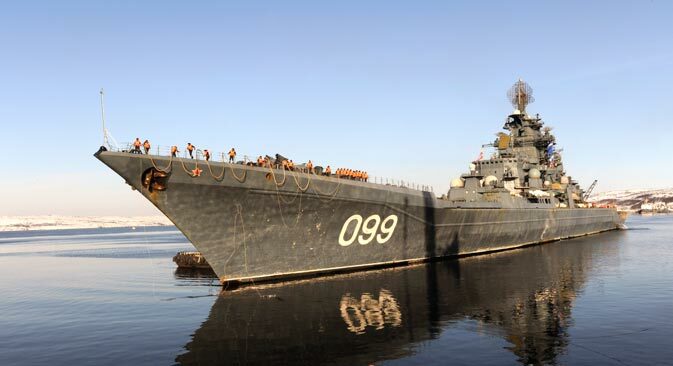 The result of their work will be a plan for Russian ships to continuously patrol the region. According to the admiral, Petr Velikydemonstrated to everyone Russia's ability to defend its interests in the Arctic region. Moreover, in the near future, this missile cruiser will be joined by another ship of the same class—the Admiral Nakhimov heavy nuclear-powered missile cruiser. The vessel is now being completed in Severodvinsk shipyards. Once it is completed, it will be the most modern and powerful ship in the Russian navy, which will allow Moscow to continuously monitor and protect its Arctic territories.